Tea jelly is exactly what it sounds like. It’s jelly that is made out of tea. 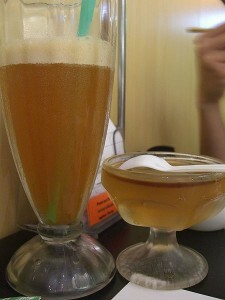 Made simply from tea soup, acids and pectin or gelatin, tea jelly is known for the retention of a tea’s special flavor. The next time that you’re brewing your favorite tea, consider making it into a tasty spread which not only is a delight to eat, but which is also packed with all of the goodness of the tea at its base. It’s yet another way to enjoy the antioxidants and myriad of other health benefits that tea has to offer. The tea jelly known as Yokan is enjoyed in Korea and Japan, and is a dense, jelly dessert made from, among other things, green tea. The idea of making jelly from your favorite tea is as natural as making jelly from any one of your favorite fruits, and Eastern cultures have long enjoyed this tradition. As you consider giving the tea jelly a try, consider your favorite flavors of tea. You may enjoy mild, green tea, or you may want to really jazz it up with a little zing as in Red Zinger tea. The tea that you choose will determine the color and flavor of your tea jelly, so for milder flavors like green tea, you may wish to add a splash of juice for flavor; or you my choose to blend it with a fruity tea blend instead. Some of the bolder flavors are produced by herbal teas can stand on their own. They make a delicious and refreshing spread for your morning toast as well as for an afternoon biscuit. So whether you infuse your tea soup with fruit juice or a tea blend is entirely up to your taste preference, and whether your finished product is mild and understated, fruity or refreshing it is sure to be not only delicious but good for you as well.